The Pelican 1519 Photographer's Lid organizer is designed specifically for the Pelican 1510 case. It installs easily with the included screws for mounting the organizer to the lid. The Pelican 1510 is made of ballistic nylon with nylon zippers, and features a variety of pockets in different sizes to store and keep your gear organized. Box Dimensions (LxWxH) 20.0 x 11.0 x 0.1"
1519 Photographer's Lid Organizer for Pelican 1510 Case is rated 4.4 out of 5 by 294. Rated 4 out of 5 by Tucker from A must have accessory This lid organizer is a must have for the odds and ends not normally stored in the divider sections of the Pelican box. Installation is a bit tedious. Placing the open box so the lid is flat on the floor and giving the screws a head start by slightly enlarging the pre-drilled holes are good tips for the installer. The foam lid insert which comes with the Pelican box cannot be used in combination with the organizer unless the organizer is left empty or nearly empty. A sheet of bubble wrap or thin foam slightly smaller than the lid can be laid over the items in the box dividers for extra protection when the lid foam cannot be used because the organizer is too full. Rated 4 out of 5 by Anonymous from Useful, but could be better. Useful, but could be better. Don't get me wrong, I am glad I purchased it. It's a great way to store cables, cards and other smaller pieces of gear. The installation was a bit tricky as you are expected to screw the lid organizer into the lid of the Pelican case through the mesh pockets. The bottom screws are extremely difficult to install unless you have a small Phillips screwdriver that can fit through the mesh pockets without damaging them. I also ended up keeping and using the lid foam that came with the Pelican as it added protection for the gear below. The lid organizer alone is not padding enough to protect the gear below. Rated 3 out of 5 by Andrew from Meh, it's ok, It's not bad but leaves plenty of room for improvement. The construction is good enough but nothing mind blowing. The utility is there but could be improved with a redesigned layout. Having a flat surface with velcro across the whole thing might be more useful. That way you could mount various pouches and such where you need them. ti would also allow you to leave voids if you have thick items (like camera bodies) that protrude up a bit. I think in hindsight I might have been more happy building a custom organizer. But this was way faster and I'm sure I'll use it as is for quite a while. Some third party really needs to build a better solution for this. Rated 3 out of 5 by Mr Specbus from It fits in the Pelican 1510 Case The organizer has five zippered pockets that are useful for holding cables and small accessories. It is, however, not designed to be easily installed. First you have to drill pilot holes. Then you have to use care not to damage the mesh pockets since the mounting points require that you stretch the pockets to get a screwdriver on the screws. If you try to screw it in through the mesh, the mesh tends to wrap itself around the screwdriver. I got it installed without damaging it but it took an hour. Pelican needs to put a bit more thought into this design. I also own a 1510 case with an organizer factory installed. The factory version is more robust and has a better design for installation. Rated 5 out of 5 by Anonymous from A Must for the Pelican 1510/1514! I could dock one star because this thing is a pain to install, but I love it so much I won't. I did it the good ol' fashioned way with some elbow grease and a screw driver, and it took me an entire hour to screw six screws in! The placement of the screw holes inside some of the pockets make them a bit challenging to get to, and screwing through the material of the Pelican case is tough to say the least. But all in all, once you've got it installed, it makes life so much easier! The pocket sizes are great for all the small stuff I need to carry with me: audio cables, CF cards, SD cards, batteries, chargers, and filters. Great organization piece! Rated 5 out of 5 by Anonymous from Must Have for the Pelican 1510 I'm a big fan on anything Pelican! I have multiple Pelican cases, one being the model 1510 for my camera gear; when I originally purchased the 1510 without the lid organizer; however, after my camera gear started to grow I needed space to hold all those odds and ends, such as batteries, cables, pocket wizards, etc. I couldn't be more pleased with my purchase! I'm in total agreement with the other reviews that the install with the screws can be painful; but it can be avoided somewhat if you drill pilot holes and have the proper size screwdriver; the organizer is great addition and highly recommend it; a great addition to the 1510 and a MUST HAVE!! Rated 4 out of 5 by ThePhotogsBlog from $ bucks well-spent. Installation was a snap. The trick is to start the screw hols manually with a small hand drill or somesuch. Once in place it provides much needed added storage and organizational space for the numerous, not terribly fragile but nonetheless important small items and commercial photographer wants to carry with him. This frees up padded compartments for the more expensive and fragile items such as additional lenses, speedlights or back-up camera bodies. My only negative comment is that the zippers are not the best quality and that you should use two hands to open and close them. Bottom line: it was $$ well-spent. Rated 4 out of 5 by Eric from Nice addition to the 1510 This is a solid piece that adds extra storage for things like filters, batteries, tools, and lens cleaning items. It is awkward to install, as other reviewers have stated. I would recommend using a drill to start small pilot holes for the tiny screws supplied with the lid organizer. 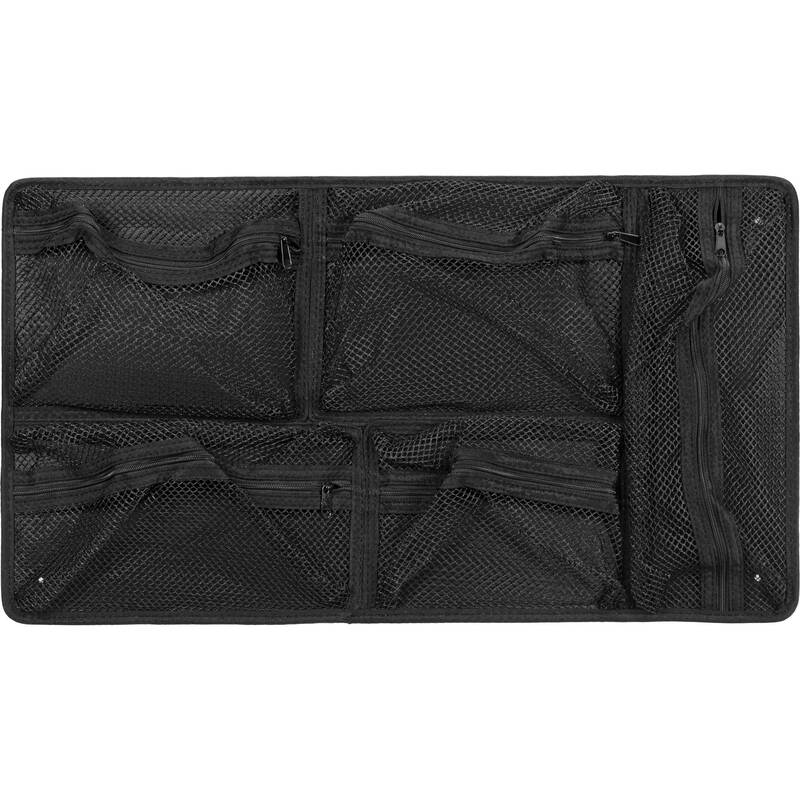 I think that replacing the protective foam insert with this organizer does mean that you are sacrificing a little in terms of padding, but after some serious use, I don't see any harm from that. For photographers who are subjecting their kit to lots of abuse, they might want to get some thinner foam to lay in between the organizer and the rest of the case. Does this get mounted instead of the 1 foam or on top of it? This product would mount in place of the foam insert under the lid of a Pelican 1510. Will this fix the pelican 1560 case? No, the 1560 case is a very different shape than the 1510. Pelican makes the 1569 Lid Organizer specifically for the 1560 case. Could this lid organizer also fit and be installed properly on the 1535 case? Asked by: Hsiang Chieh H.
Anyone know if this would mount inside a Nanuk 935? It might fit yes, but the screw holes to attach to the lid are specific to the Pelican case so I would suggest finding another option. Would this work with the Pelican 1510TP case? Would I place it on top of the foam or remove the foam under the lid? The foam has to be removed. On the inside of the plastic lid, there are spots to screw in the organizer. Depending on what you have in the main part of the case, you could cover it with the original foam from the lid and then close the lid... I my case, the organizer acts as the top padding for the main case and I have had no problems protecting my camera strobes and such. what is on the backside of the organizer? is it a cardboard or plastic? if plastic does anyone know what type ? It is plastic and has been very durable. Not sure about the type of plastic. Will this fit the lid of a Storm im2500? 1510 (Carry-On Case)INTERIOR (L X W X D)19.75 x 11.00 x 7.60 (50.2 x 27.9 x 19.3 cm)iM2500 (Travel Case)INTERIOR (L X W X D)20.50 x 11.50 x 7.20 (52.1 x 29.2 x 18.3 cm)If you compare the size of the lid, you realize the Storm im2500 is bigger than the 1510 Case. So yes it will fit perfectly since I find it fits a bit too tight in the 1510 Case. BUT, the 1510 Case is made to have a lid organizer since it as 6 bumps ready to receive the 6 cheap screws (comes with the lid organizer). They are a hassle to screw in, the holes of the lid are not perfectly centered with the bumps and you need to put a lot of pressure on the screws to make sure you do not dig a hole with screws loose in each hole. Do not use a drill; go at it by hand. On the other side, you could use 2 way tape to put the lid organizer in. Thought I would recommend velcro (a velcro you can tape; often found in hardware stores) to give you the ability to take it off more easily in the case you would like to remove it easily, clean it, etc (The back end of the lid organizer is made with a rigid, flat, smooth piece of plastic; velcro would stick to both the lid and the lid organizer). If you use the velcro technique, it would even give you more space since the bumps are what I would measure at least a quarter of an inch long (from memory). Plus, the depth of the lid for the Storm im2500 is already deeper than the 1510 Case.In light of this information, I do not understand the exact purpose of your case, but I am certain I could put the Pelican 1519 Photographer's Lid Organizer for Pelican 1510 Case in a Storm im2500 using velcro. It would hold well, be easily removed and fit better than the intended case. Should this be fastened through screws or there is another way to attach it to the case? Please describe attaching procedure and additional things required for attaching.Thanks! The 1510 Case is made to have a lid organizer since it as 6 bumps ready to receive the 6 cheap screws (comes with the lid organizer). They are a hassle to screw in, the holes of the lid are not perfectly centered with the bumps and you need to put a lot of pressure on the screws to make sure you do not dig a hole with screws loose in each hole. Do not use a drill; go at it by hand. Since the bumps are what I would measure at least a quarter of an inch long (from memory), I do not know any other solution to attach the lid organizer unless you take a grinder and grind each bump down (can be a bit difficult, possible to damage the case if you're not handy, forget the warranty afterwards) and then use 2 way tape.Thought I would recommend velcro (a velcro you can tape; often found in hardware stores) to give you the ability to take it off more easily in the case you would like to remove it easily, clean it, etc (The back end of the lid organizer is made with a rigid, flat, smooth piece of plastic; velcro would stick to both the lid and the lid organizer). If you use the velcro technique, it would even give you more space.